Making a font behave as a handwritten letter within the limits of a typographic system is complex. In order to give more authenticity to the text and to contribute to fluent reading, our typeface will include those ligatures that are more frequent in our language. For example, some letter combinations such as “r r” and “s s” will be replaced by ligatures. The “Ligatures” function is activated by default, the extras are activated with the “Discretional Ligatures” OT feature. All these characteristics contribute to the fact that phrases or texts composed with the Brushland typeface, will give a greater sensation of real writing than the available script fonts. The font has 1,280 glyphs or typographical signs, and allows to compose texts in the most common languages written with the Latin Alphabet. The design of Radar is an homage to 20th-century grotesque typefaces and a product of that particular historical context. At the beginning of the 20th century, the world industrial expansion was at its peak and great advances took place in the field of technology. Among them, and in the context of the 20s, there was radio technology, an immaterial and at the same time global media and a phenomenon that contributed to the consolidation of the mass society as a whole. At the same time, a type family for advertising use named Grotesca Radio was born in the Richard Gans Type Foundry. His authorship is attributed to the German type designer and master punch cutter Carl Winkow. Richard Gans Type Foundry created its own typeface for advertising use, which had a clean, modern and geometric drawing. At the same time, many other geometric typographies were commercialized, like Predilecta from Iranzo Type Foundry, and Grotesca Nacional and Electra from Nacional Type Foundry. On the international scene, there is a connection with Futura (1927), a Paul Renner’s design distributed in Spain by Neufville Type Foundry and with Erbar (1922) by Jakob Erbar. Although Paul Renner’s Futura is well-known in the typography world, it is important to point out at that time there were other typographic achievements. 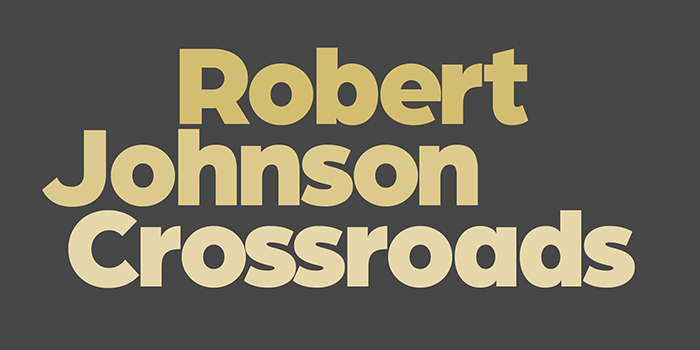 Radar connects formally with Grotesca Radio, Richard Gans’ novelty in their catalog and is a grotesque creation with a Deco twist, offered now in 4 weights and prepared for contemporary use. Choose among Radar Fina (Thin), Texto (Text), Seminegra (Semi Bold) and Negra (Bold). I would like to point out that new typeface designs appeared at the beginning of the 20th century justified by a specific context. Until the start of the First World War Richard Gans Type Foundry (Madrid, 1881) developed its activity in collaboration with some German companies, importing from abroad most of the material needed. At the beginning of the war, and justified by the lack of supplies, the need for new designs was born. Carl Winkow did this, supported by some assistants who worked with him at the engraving workshop. A great compendium of new drawings in the typographic Spanish scene of this century was possible thanks to the professionalism and prestige of this master. The first printed examples of Grotesca Radio typeface are in Richard Gans Foundry’s catalog first published in 1922. But the key piece at the documentation stage and the most important through all the process of digital recovery is a catalog from 1964, where we can find evidence of the general use of grotesques: “Industry businesses prefer using Grotesque typefaces, due to the simplicity, seriousness, and clarity of their drawing.” The permanence of this typeface throughout this foundry’s existence, as well as the number of styles designed, are a testimony of its success over the years, becoming an exceptional product in the catalog. After the Spanish Civil War (1936-39) the Richard Gans Type Foundry restarted its production and commercial activity, becoming a reference for the Spanish panorama, together with Iranzo, Nacional and Neufville type foundries. But with new printing systems, firstly photocomposition and later desktop publishing, the demand for metal type was declining until it became practically null. For this reason, a great restructuring improvement was necessary and, those companies who didn’t implement them were fated to disappear. This was the case for Richard Gans, which closed down and that’s why over time Grotesca Radio typeface was left in oblivion. Radar is a sans serif typeface, geometric and mono-lineal. Its design can be related to the body of creations from the early 20th century which, contextualized in the avant-garde European period, believed that the sans serif typographic trend was the most modern and appropriate expression for those days. There is a clear geometric pattern in Grotesca Radio that makes it easy to spread the construction rules to all the glyphs. As a remarkable feature, this typeface has a short x-height and very high ascenders, which gives it a sophisticated air but complicates its use as a continuous text. Therefore, I recommend using it for headlines or short text paragraphs. There were many challenges to adapt the old design to current user needs, involving both software aspects and graphic and drawing details. Radar has a complete character set which includes a set of alternates in capital letters B, E, F, H, S, and T. There’s also the possibility to choose between “a” in two different lowercases. Contemporary basic glyphs and their composites, the numeric section, punctuation and diacritic symbols were determined. Finally, and without compromising the mono-lineal aspect of the font, many optical adjustments were necessary, such as ink traps, more pronounced with increasing weight. With interpolating process an intermediate version of the font was born, suitable for its use in body text. Radar family consists of four fonts: Fina (Light), Texto (Text), Seminegra (Semi Black) and Negra (Black). Radar font took part of the Third International Congress of Typography, celebrated in Valencia, Spain (2008) and takes part of Carácter Latino (2012), written by J. Vilafranca in collaboration with Spanish publisher Index Book, which specializes in graphic design and visual communication. 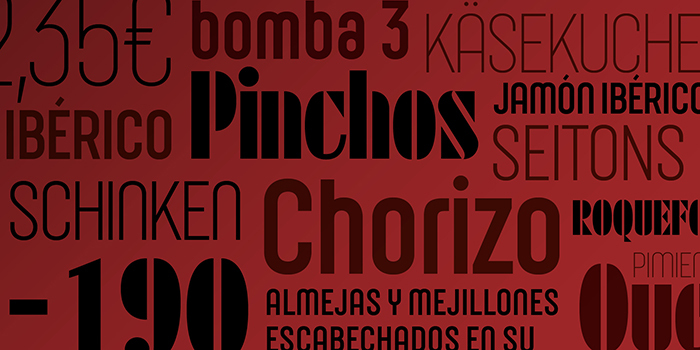 This book compiles the most important typographic projects of the Latin scene at that time. In 2014 Marta Sánchez was an invited teacher presenting her project at the Faculty of Computer Science and Media Technology at Gjøvik University College (Norway). To finish with, it is important to say that this project is developed from a deep sense of respect for the original font and it is not intended as a strict revival, but as a contemporary re-interpretation. A great deal of research and drawing was necessary, for use in a contemporary technological environment. Marta Sánchez Marco is a graphic designer, photographer, and educator. She has worked in the graphic design industry since 2008. She holds a bachelor degree in Fine Arts and postgraduate degrees in Typography at EINA and in Still Life Photography at IEFC (both in Barcelona). She has also participated in several projects and exhibitions. Special thanks to José Manuel Urós, Íñigo Jerez and Laura Meseguer, who provided guidance in my Postgraduate Degree in Advanced Typography in Eina. Thanks to Jesus del Hoyo Arjona and Oriol Viñals Moret, who helped me in the Letterpress Workshop at the Faculty of Fine Arts at the University of Barcelona, where I had the opportunity to work with some metal types of the Grotesca Radio as well as having access to Richard Gans Foundry's catalog from 1964. Thanks to Dimas García Moreno and José Ramón Penela Rodríguez, whose texts on Richard Gans Type Foundry I used as a primary source of information. Radar is a revival of the sans serif typeface “Grotesca Radio”, from the Spanish foundry Richard Gans, which existed from 1888 to 1975. Although the new version of this font has always tried to keep accurate similarities close to the original typeface, Radar is not intended as a strict revival, but as a contemporary reinterpretation. In this new version, the user can find some alternate characters that give the typeface a more art-déco or somewhat neutral twist. It is January 2019 and we are publishing a new version of Memimas 28 years after its first public release. During this time, the font has gone through numerous updates, mostly technical implementations. With this new version, which is a major upgrade, we have incorporated new styles and features that expand the capabilities of expression and use of the fonts. The design of the Memimas Italics is an obvious choice to expand a font family based on an upright script, which is to look for its 'natural' form, its cursive origins. For this design, we decided to maintain a close relationship with the structure of the romans, introducing only small differentiating details in connections and loops and replacing some capital letters with more expressive forms, keeping the swashes to a minimum. For the Memimas Ultra, we had to completely redefine the height of x-height to get real sate to draw the lowercase, while adding modulation and rhythm elements. There is something about the visual landscape of the Basque Country that will not go unnoticed to the eyes of its visitors regardless of their knowledge of typography: the peculiar lettering style spread all over the region on street plates, signs, posters and fascias. They display extremely heavy letters in a sort of overemphasised glyphic style with characteristic concave stems that produce very sharp terminals and awkward letter forms. Those shapes look certainly rough, unrefined and overdone, conveying a sort of primitiveness rooted way back in time. This seems to make it a convenient choice for food shops, restaurants, cider houses and other cases in which projecting the idea of authenticity, tradition and "Basqueness" is intended. Harri, as a typographic project, started the very day a client asked me to design a logo that would be clearly recognised as Basque, with a firm restriction: to avoid "that typeface used for cider houses and butcher shops", in obvious reference to the Basque lettering style afore-mentioned. They definitely needed a more polished image, and I realised there was nothing I could use to meet their expectations. So there was a need and there was room for innovation, and I decided something had to be done. 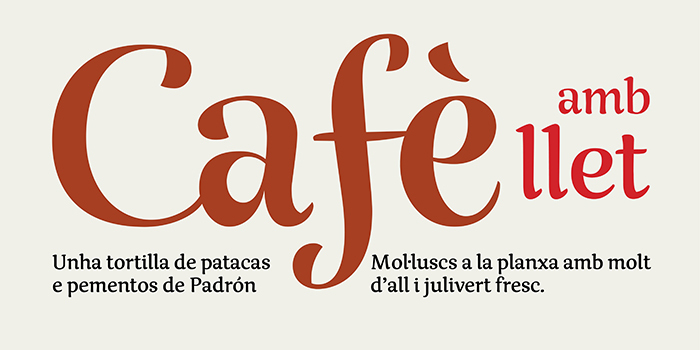 Years later I defined Harri as a Basque "low-fat" typeface because its starting point was a light and refined version that would contrast strongly with the black, almost fat, letter forms customary in this style. The final project comprises also those black variants because they are the main inspiration for both the overall design and the details of most of the characters, the sort of details that show its unmistakable "Basqueness". The research for the project and the design of Harri was done in the Basque Country. And, if there is something that defines Basque people is that, whatever their political views, they are extremely opinionated about nationalism. As a result, it is almost impossible to talk about any Basque cultural instance and not getting trapped in the discourse of nationalism vs. no-nationalism which, let's be serious, needs to be rephrased as myNationalism vs. yourNationalism. When it comes to the origin of the "Basque" lettering style it is not difficult to find such conflicting views, this is people convinced that it is a vernacular style from the Basque Country and others who think it is just an invention of the nationalist movements in the early 20th century, that is, nothing original, or at least nothing traditionally Basque at all. The interesting thing is that, to some extent, both views are equally wrong, which in the end makes them complementary. It is obvious that nationalist movements fostered the development of a visual system aimed at reinforcing both their distinctiveness and their presence in the Basque society of the early 20th century. 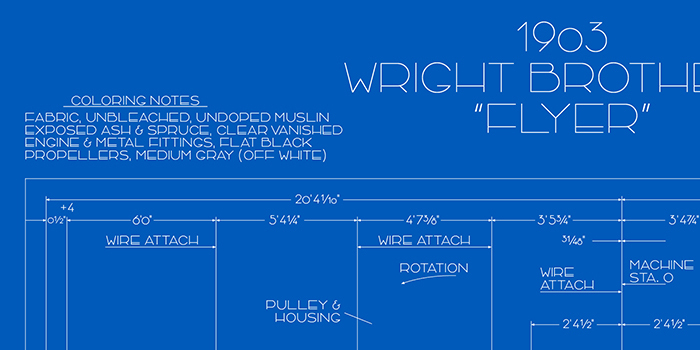 Typography, or better-said lettering, had to play a significant role in that endeavour. But it is also undeniable that it is not the mere invention of the propaganda manager of a nationalist organisation. There are clear sources of inspiration that have been pointed out by different scholars regardless of their position on Basque nationalism. These sources are the ancient inscriptions carved on gravestones* which can still be found in the French part of the Basque Country (Behe Nafarroa, Lapurdi and Zuberoa) and some areas of the North of Navarra. These inscriptions —some of them dated in the 17th century— show a recognisable influence of contemporary engravings and some Romanesque inscriptions of earlier times that can be found all over Europe. Therefore, it is easy to agree that it is neither a relatively recent invention nor a deeply rooted and exclusively Basque manifestation. That said, which I find original and unique is the way it has evolved from those origins. And the most remarkable fact in my view is how its use has spread all over the Basque Country as an identity conveyor. The fact that Basque people seem to feel identified by this lettering style, and moreover, the fact that people from other places associate those forms with a Basque origin is what makes them convincingly Basque. Harri takes part of its significant features from those ancient inscriptions, in which letters are not incised but carved in relief. The fact that the space between letters is what has to be removed produce heavier and less contrasting shapes and gives rise to a series of interesting composition devices for space saving. Of course, the current widely-used shapes derived from them are taken into account but keeping always in sight their predecessors: the Romanesque inscriptions and ultimately the Roman Capitals, in which its proportions are based. As a central guideline, there is the idea of making a refined yet decidedly Basque typeface —something that my client would have been willing to use— and also to echo the peculiar evolution of this style through its weights, from the clean formal Roman-inspired light to the extreme expressive Basque-style extra bold. Besides that, some of the space-saving tricks that make every piece of stone carving unique are available as contextual alternates, and a bunch of stylistic sets allow to change the shapes of some key letters in order to emphasise or completely neutralise its Basque character. * The name "Harri", meaning stone in The Basque language, is an homage to its roots. Great news arrived. Today we got the news that Laura's typeface family Multi has been selected and reviewed by Yves Peters as one of the "Our Favourite Typefaces of 2016" for Typographica. There is no better reward for a type designer that being appreciated by others who can see what is behind the work you have done. Founded in 2002, Typographica is a review of typefaces and type books, with occasional commentary on fonts and typographic design. Edited by Stephen Coles with Caren Litherland and designed by Chris Hamamoto. Typographica's Favourite typefaces selections are made by graphic designers, type designers, educators, and enthusiasts who have a taste and good eye for type. We have to thank Yves for his words, so elegant and subtle. He writes how he feels, not how he thinks, that's poetry for us. You can read his review here. Improved versions of some of our typefaces families: Arboria, Arbotek, Joost and Rumba. Probably you already know that these four families are pretty different. ARBORIA and ARBOTEK are related to each other because both are based on a geometric construction, while Arboria has six weights and two constructions — Roman and Italic — and is meant for editorial design projects, Arbotek has more variety among the four styles. JOOST, in its third incarnation, originally published in 1995, has abandoned the original modules to obtain a better relationship between the different styles. The new set of characters incorporates Central European, stylistic set for capital letters and an OpenType Features repertoire. Finally, RUMBA, which is based on a calligraphic structure, explores the optical sizes principle from a very personal way. In coincidence with the release of these typefaces in TypeNetwork, we have included some extra characters and improve the performance of the OT Features.